You’re at your favorite restaurant and you’re frustrated. You can’t order your go-to meal because of your missing tooth. It’s really embarrassing as you struggle to chew and you don’t want your family to see. Sadly, you resort to the soup of the day, which seems rather unsatisfying. This is a daily consideration for someone living with a missing tooth. Eating, talking, and smiling becomes difficult and embarrassing, however there are solutions that will restore your tooth and your oral health. 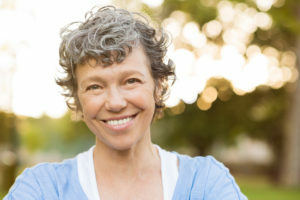 Let’s look at the benefits of dental implants in Sachse. While you struggle to eat and smile each day, you may not even realize that your missing tooth is also affecting your oral health. Without a root to support, your bone begins to deteriorate, which eliminates support for your remaining teeth and could eventually lead to more tooth loss. Meanwhile, your healthy teeth will begin to shift into the open space left by your missing tooth. This causes issues such as bite misalignment and increases your risk to cause damage or fractures to those remaining teeth. When you lose a tooth, it’s a good idea to replace it as soon as you can. A dental implant is by far the best replacement option for your tooth because it restores both your tooth and your root. There isn’t any other restoration that can offer those benefits. Dental implants can also be used to support other dental prosthetics such as a dental bridge or denture, which makes them an excellent option for restoring multiple missing teeth as well. A dental implant utilizes a titanium post that is surgically placed into your bone to restore your root. Because titanium is biocompatible, it will naturally integrate with your bone and create a stable foundation for your new tooth, while keeping your bone healthy and stimulated. Your new tooth is a customized porcelain crown designed to naturally complement your smile. Because your dental implant closely mimics your natural tooth, you’ll have all the function such as eating and chewing again, and an aesthetically pleasing restoration that will make you want to smile again. In order to be successful, dental implants do require that the patient has enough healthy bone structure to support them, and that the patient is in good general health. At Sachse Family Dentistry, we’ll determine if dental implants are right for your needs during a thorough examination and with x-rays. We work closely with a trusted oral surgeon in the area who will place the implant in order to ensure success. After your implant has had time to heal and integrate, our doctor will design and place your new crown. If you’re ready to learn more about how you can reclaim your smile, contact your dentist in Sachse today to schedule your consultation.